The sights and sounds of the holidays are alive and well in the city. For starters, Starbucks has released its holiday cups and the Hudson’s Bay and Saks Fifth Avenue have revealed their iconic holiday windows. And the next major holiday kickoff will be the official tree unveiling and lighting ceremony of the CF Eaton Centre’s epic Christmas tree. If you’ve never seen it happen before, check out the grand reveal below – it will get you very excited. 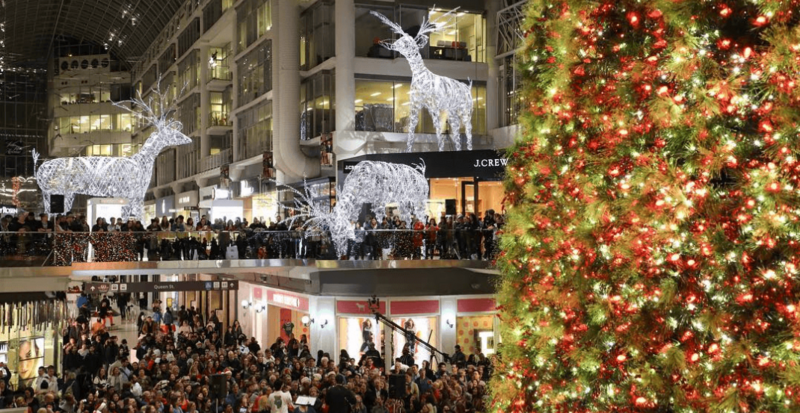 This holiday season, the Eaton Centre will be home to Canada’s largest Christmas tree, which will proudly stand 100 feet in the air, covering three levels of Toronto’s downtown mall. It’s is so large you can see its lights twinkle from the opposite side of the mall. The tree will be unveiled on Thursday, November 15 by a local celebrity, who will host this year’s festivities.